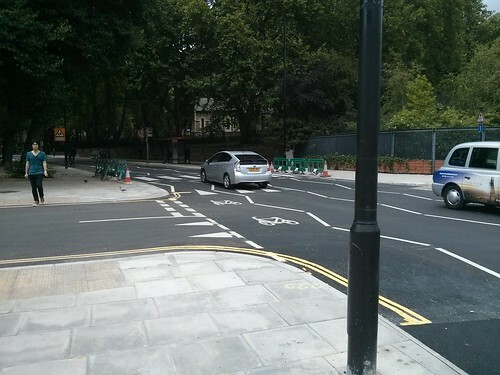 We are very pleased that Camden has (almost) completed the first of the planned extensions to the segregated cycle tracks on Royal College Street. 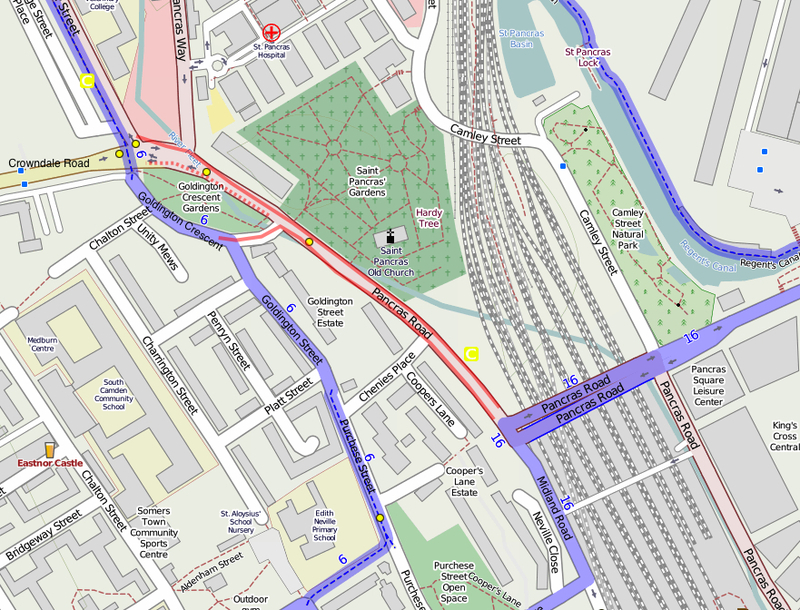 The blue line (6) on the map below shows the southern end of Royal College Street and its continuation into Somerstown via Goldington Crescent. 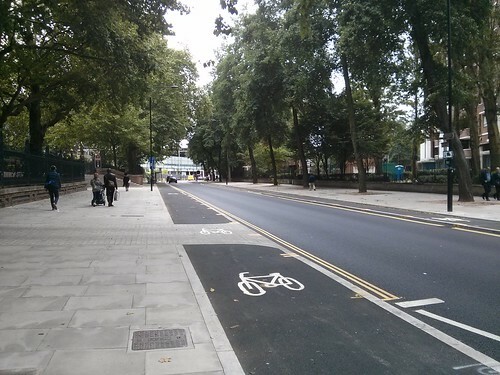 The new route that has just opened follows the pink line on Pancras Road as far as the junction with Midland Road. 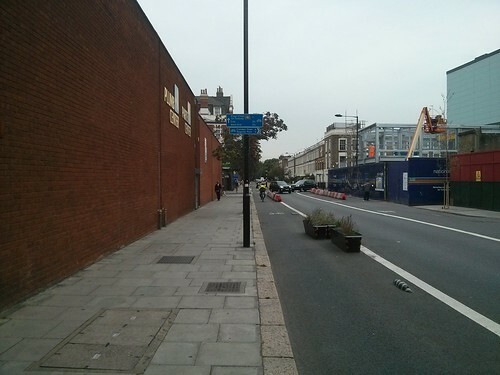 The road layout beyond this point will not be updated until the new design for the junction with Midland Road is built. The northbound route turns off into Goldington Crescent to join Route 6. There is an option of continuing west and heading for Crowndale Road (dashed pink line). The route along Pancras Road has a pair of 2m wide stepped tracks, one on each side of Pancras Road. The photo on the left below shows the northbound track and the photo on the right shows the southbound track. If you look carefully, you will see that each track has a short length of “dropped kerb” to allow people to join or leave the track. These occur at regular intervals along the track. These are referred to as stepped tracks because the level of the cycle track is between the road and the footway: with the track 50mm above the road surface and 50mm below the footway. 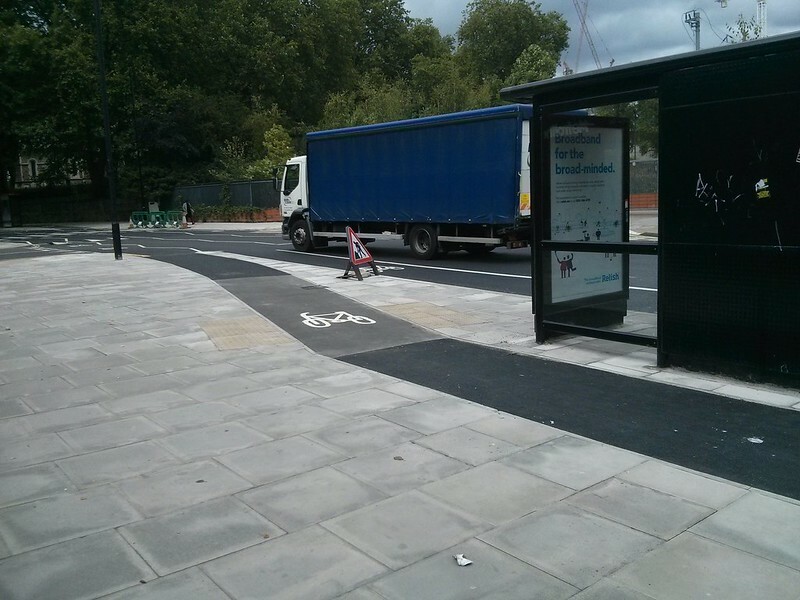 The tracks are surfaced in black tarmac so as to distinguish them clearly from the light coloured stone pavement. 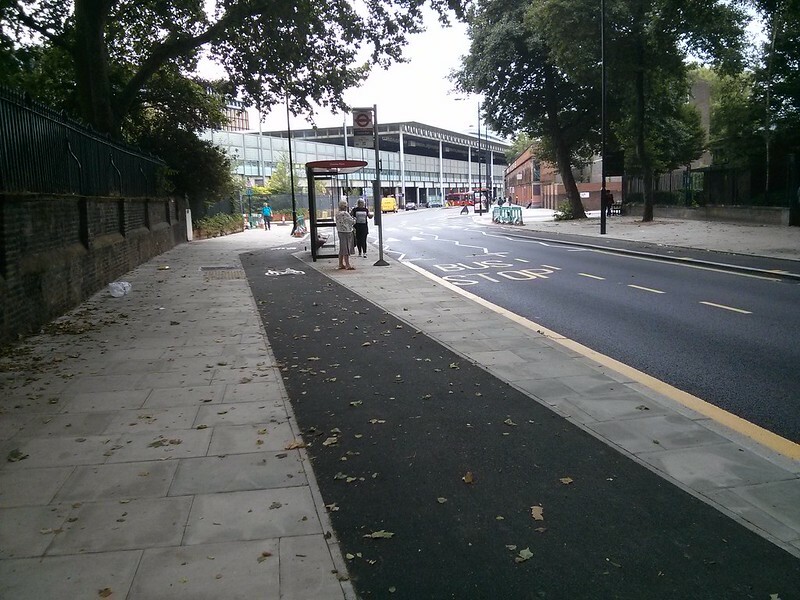 The outside edge of the cycle track is clearly bordered with a granite kerb to distinguish it from the road surface. It can be observed that the track is clearly marked with double yellow lines and blips to prevent anyone from legally parking or loading on the track. These two above photos show the steps: the photo on the left is looking across the road at the southbound track and the photo on the right shows a close up of the northbound track. Why segregation and why stepped tracks? 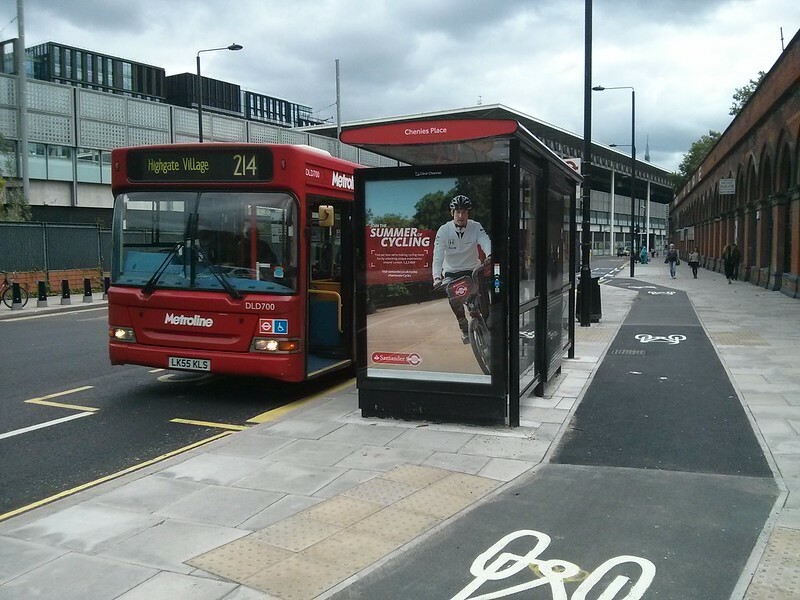 The LCC S4C campaigns are persuasive in their claim that for inclusive cycling, people on bikes must be separated from motor traffic except on quiet residential roads (e.g. with less than 2000 motors per day). Recent counts in 2014 on Pancras Road outside St Pancras Church indicated over 9000 motors per weekday, the majority (nearly 7000) being classified as medium sized – i.e. buses and lorries. Therefore, segregation is important here. 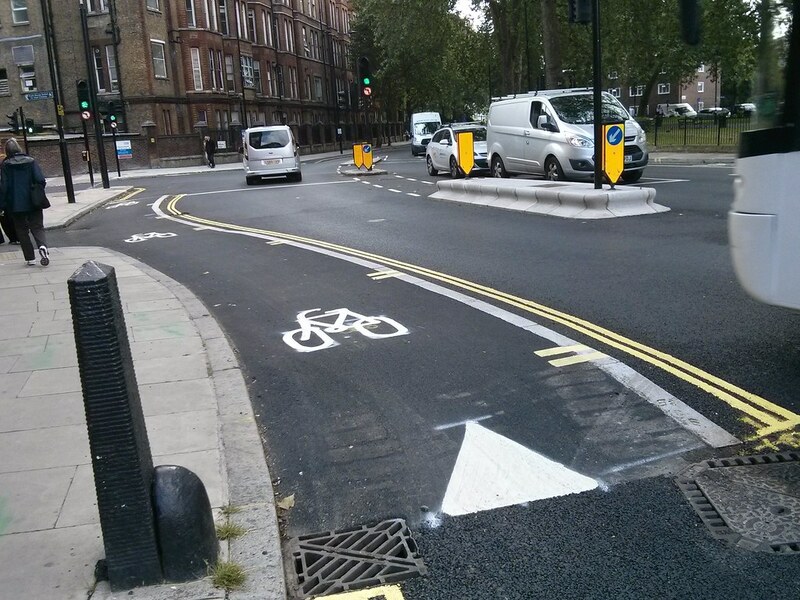 However, there is a choice between heavy segregation (with kerb separation) and light segregation (e.g. armadillos, stepped tracks or wands). 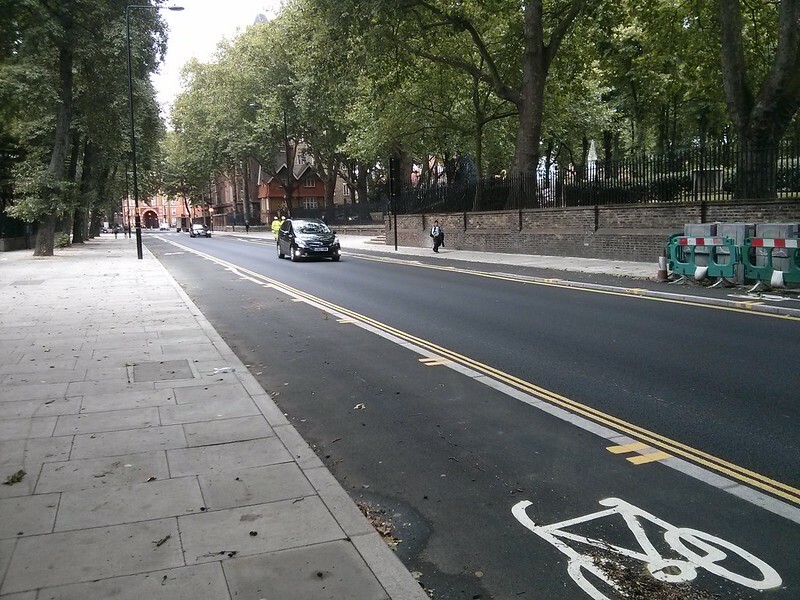 Speeds recorded at the same time as the counts show a weekday average of about 19 mph (85th percentile about 22 mph) suggested that kerb separation would not be necessary and that it would be better to use the space to provide wider tracks. Armadillos: Camden already has experience of the use of armadillos as a means of light segregation in Royal College Street. This scheme has been in place for just two years and we believe that it demonstrates that armadillos are very effective for tracks inside parked cars (see photo right). It was unfortunate that the original set of armadillos were not up to standard, getting them a bad name. The “wrong type of bolt” was used to attach them and the reflective strips were not fixed on properly. 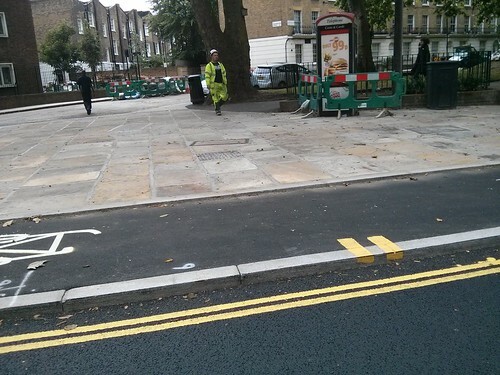 The suppliers, Cyclehoop, installed replacements early this year free of charge. These have stayed in place and are easier to see at night time. Armadillos are used successfully in Barcelona and other towns, proving that they can be used successfully. Armadillos and planters: Brian Deegan proposed this novel solution and the planters really do brighten up the ride each time the route is used. Unfortunately the original planters were abused by drivers who were unable to aim their vehicles properly and the trashed planters received more than their fair amount of trolling. 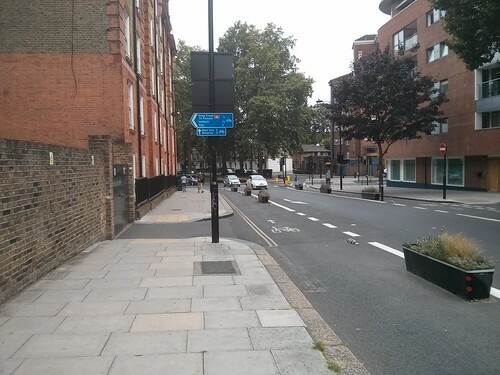 But since the white line and a few strategically-placed bollards have been installed, the planters have escaped further abuse. 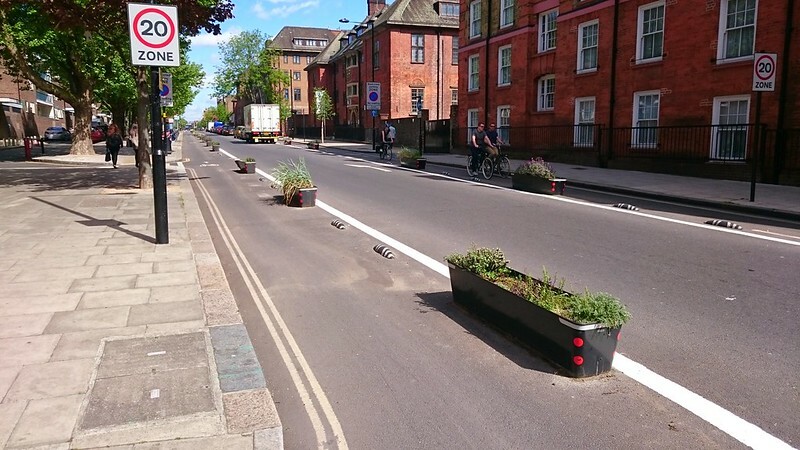 However we understand that planters are unlikely to be used in this sort of way in the near future because of the need for regular watering and replanting. 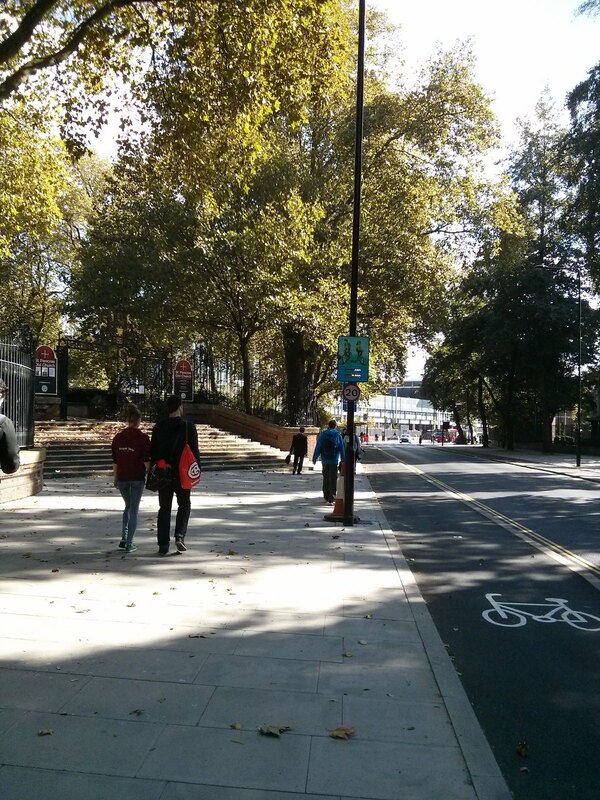 Stepped tracks: these have the advantage of giving all of the available space to the cycle track. They are much more difficult to install and cost far more than armadillos, so we hope that their choice by Camden (with our support) will prove to be justified. Our feeling is that the use of a kerb will make the track safer and more inclusive than would a line of armadillos. The two photos below shows the junction with the road closure at Goldington Crescent where the northbound route will join up with route 6. 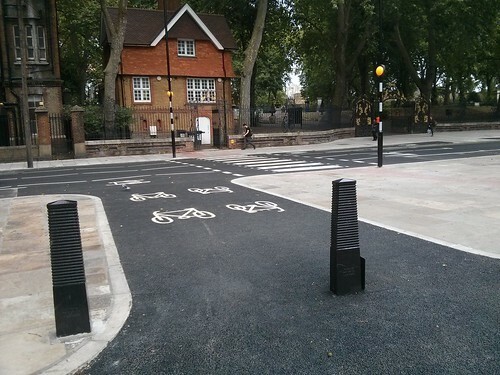 This junction is raised across all three branches so that roadway, tracks and footway are all at the same level, making it easy to cycle in and out. The photo on the left shows the southbound track rising to footway level for ease of turning right into Goldington Crescent. The photo on the right shows the view from Goldington Crescent. 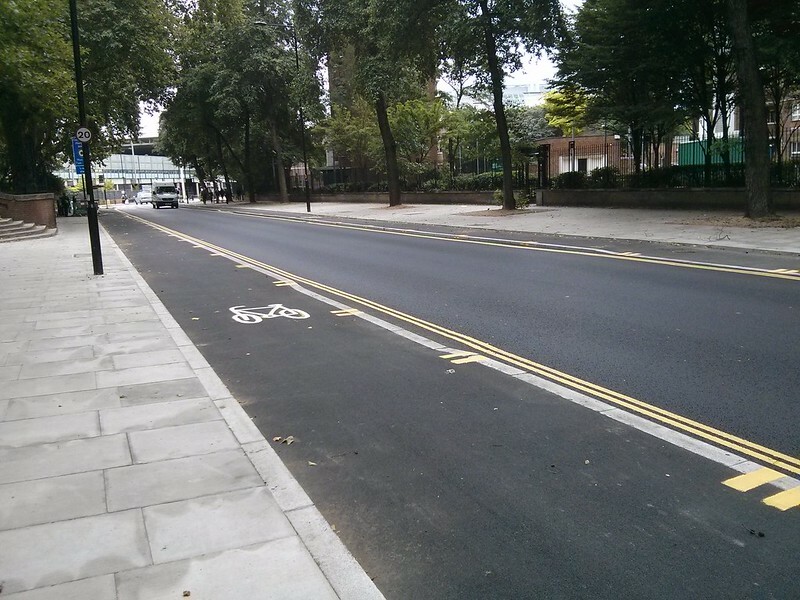 The photo on the left below shows the junction at Chenies Place (facing north) where the side road has been raised and the cycle track drops to road level as it passes the junction. The photo on the right shows the detailing where the track passes the pedestrian entrance to St Pancras Church. 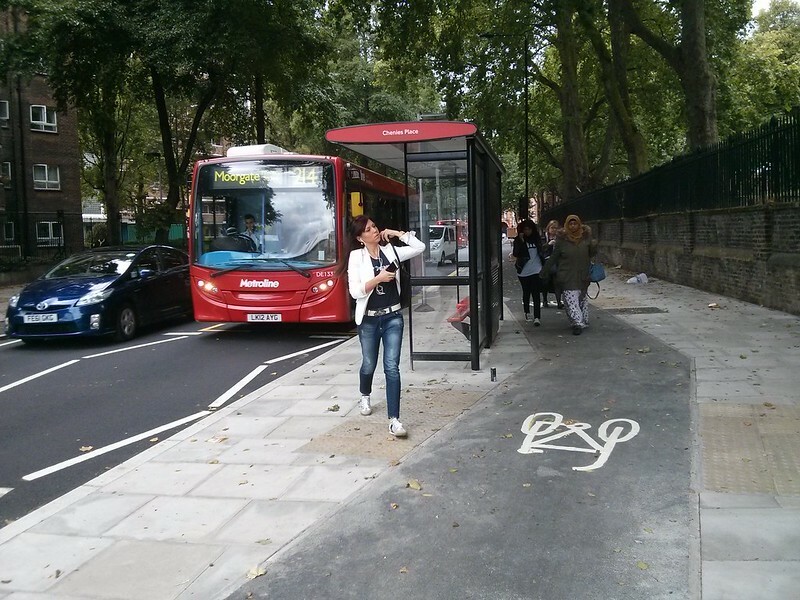 The number of bus stops has been reduced from two to one on each side of the road and each of these has been designed as floating bus stop – that is, an island containing a bus shelter from which the passengers get on and off the buses. 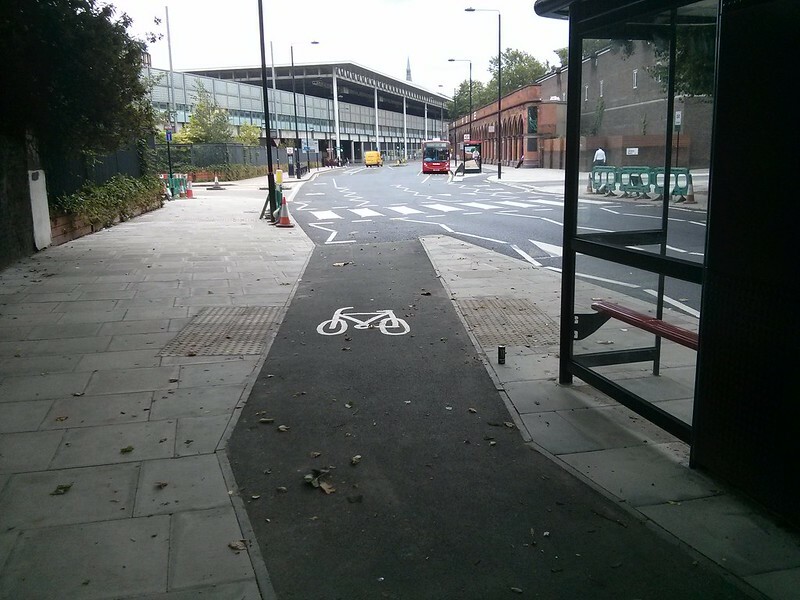 The cycle track passes behind the island. 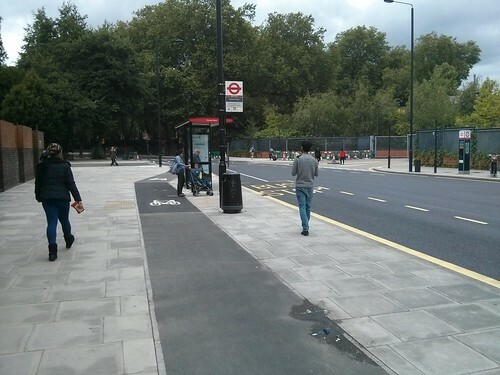 The next two photos below show the approach to the bus stop on the southbound side of Pancras Road – the cycle track moves on a very gentle curve round the back of the island with a clear view of the people waiting for the bus. The photo on the left below shows that the people getting off the bus don’t yet seem to have recognised that they are on a cycle track … it will be interesting to see their behaviour once this track becomes busy. The photo on the right shows the exit which is a little sharper. The turning on the left is not a public road – just a seldom-used entry to the railway. The road layout beyond this point will not be updated until the new design for the junction with Midland Road is built. See officers report (the last page shows the design). The Northbound stop is illustrated below. 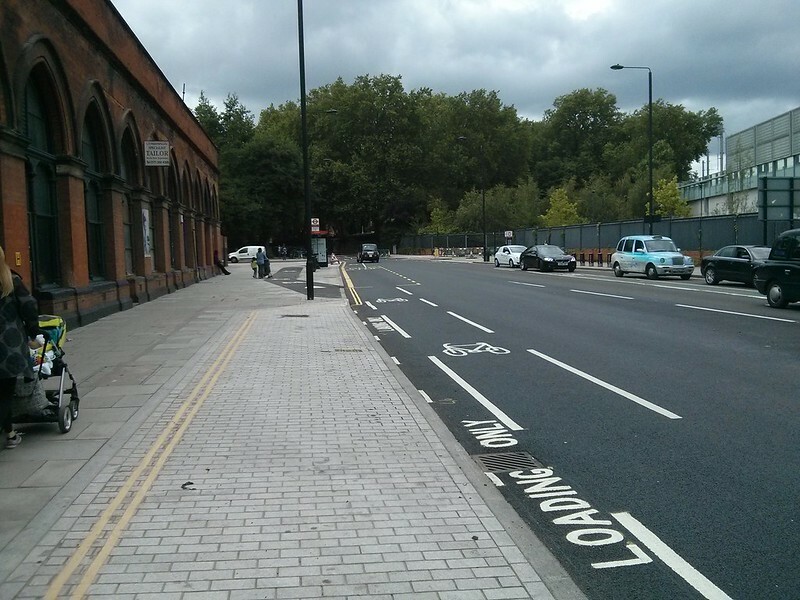 The photo on the left shows the approach past a loading bay. Camden officers insisted on giving users the alternative of using the road when no bus is waiting as the way round the bus stop is going to be a little bit longer. 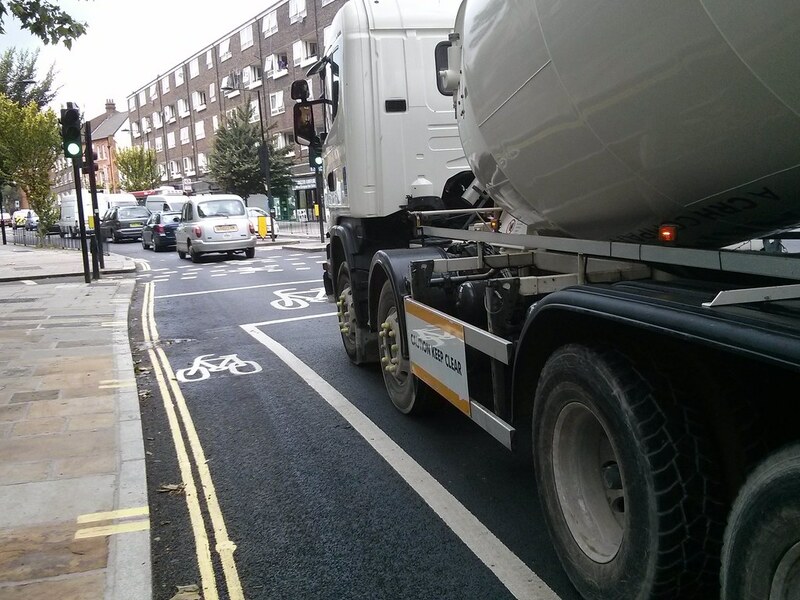 We argued that uniformity of provision would not allow this, the idea being that no part of any scheme should involve a trade-off between safety and convenience. But we have to admit that in a road with limited width (as this is), it would not be possible to have a straight cycle track without making a bulge in the road for the bus island – and that wouldn’t fit in. So we are in two minds as to whether the dual provision is a good idea. The photo on the left below shows the track rejoining the road close to the junction with Chenies Place – a lot of care went into getting a smooth re-entry to the road together with providing solid protection against left turning motors on the approach to the junction. The photo below right shows the bus in position – it stayed there for some time and the passengers had dispersed by the time this photo was taken. 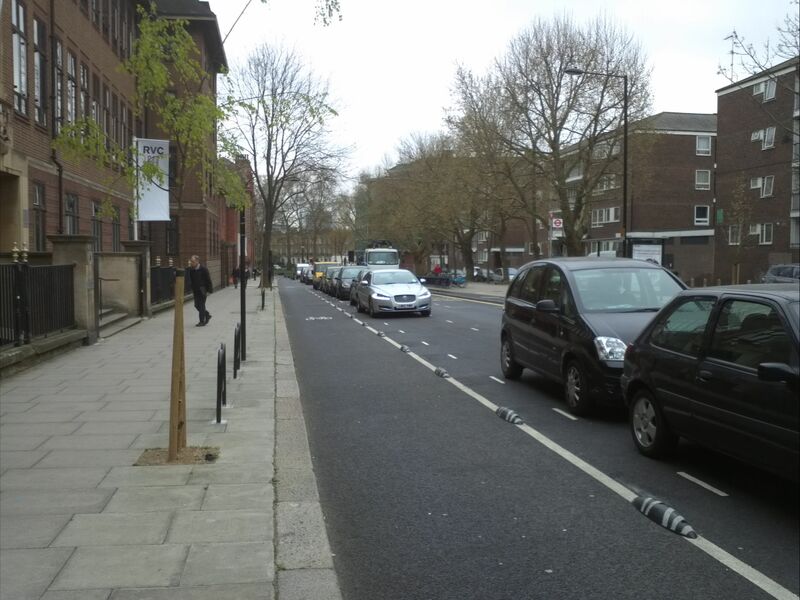 The cycling signage for the route, including the one directing cyclists through Goldington Terrace, have been ordered and we expect these to be in place over the next 2 weeks. See Signage installed 11 August 2015. Works at the junction with St Pancras Way and Royal College Street have not commenced as yet. This delay is while we wait for approvals from TfL signals, we expect to be starting work on this component in approximately 6 weeks. 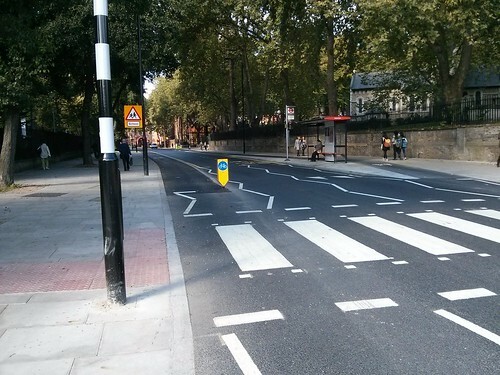 The new zebra crossing at Chenies Place is currently closed while we wait for the belisha beacons to be installed and the neighbouring footway works are completed. These will be finalised shortly and the crossing opened for operation. 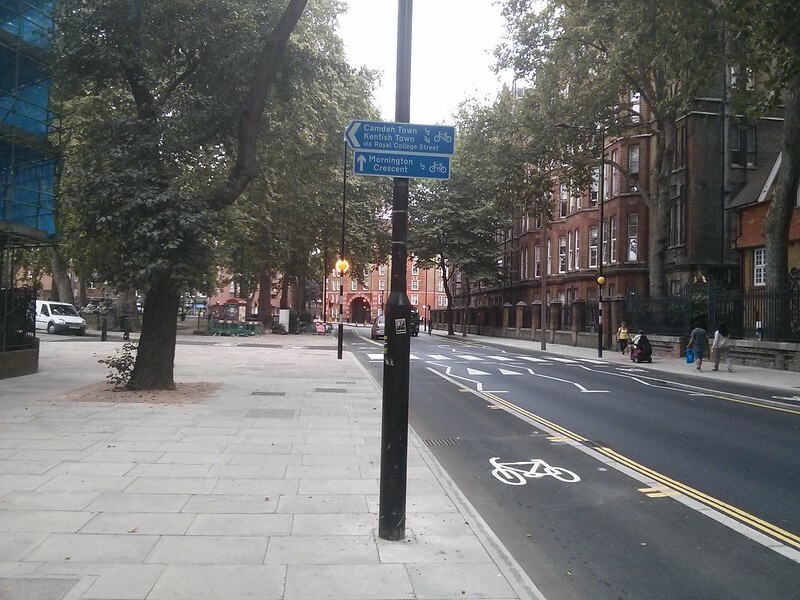 See photo 1st October 2015. 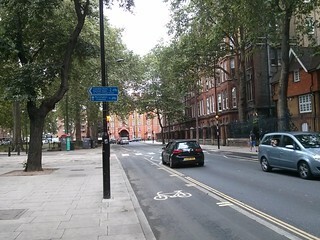 Riding southbound on Royal College Street, the original sign by Pratt Street for “West End and Waterloo” straight on, has been replaced by a sign for “Kings Cross and St Pancras Stations, City and West End. Continuing southbound on Royal College Street another sign on the approach to Crowndale Road, now has a new plate indicating “Kings Cross and St Pancras Stations, Holborn and City left as well as the original sign for “West End and Waterloo” straight on. On the northbound journey on Pancras Way, the crucial sign on the approach to Goldington Crescent indicates that people should turn left into Goldington Crescent in order to get to Camden Town and Kentish Town via Royal College Street as shown by the blue line on our map above (and those that do so will avoid the St Pancras Way junction and the nasty right turn into Royal College Street). 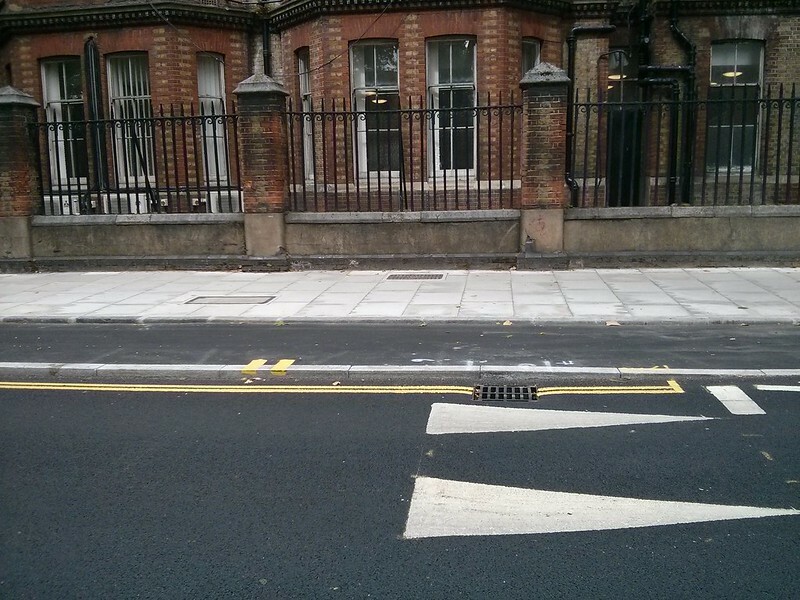 Although the surfaces of the new tracks appeared very smooth, there are small ‘waves’ on the surface and fast cyclists were reporting that it was “bumpy”. The surface is as good as can be produced when “had laid”. 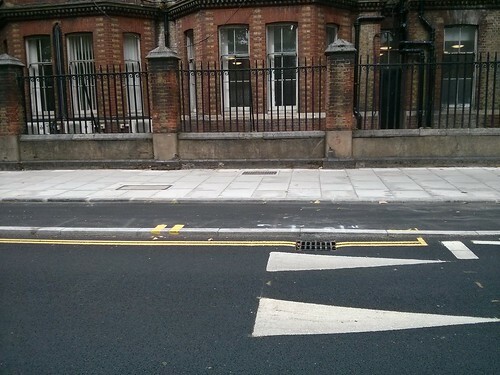 But after establishing that machines have been used for the final surface layer on stepped tracks in Old Shoreham Road Brighton and Hills Road Cambridge, Camden Council decided to do the same “out of normal hours”. So we were pleased to see the following tweet on 18th September. 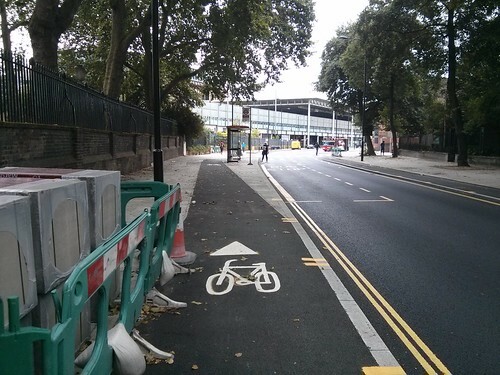 This cycle counter came into service in the first week in October and the early counts indicate that about 1000 cyclists per day are using the stepped tracks in Pancras Road. 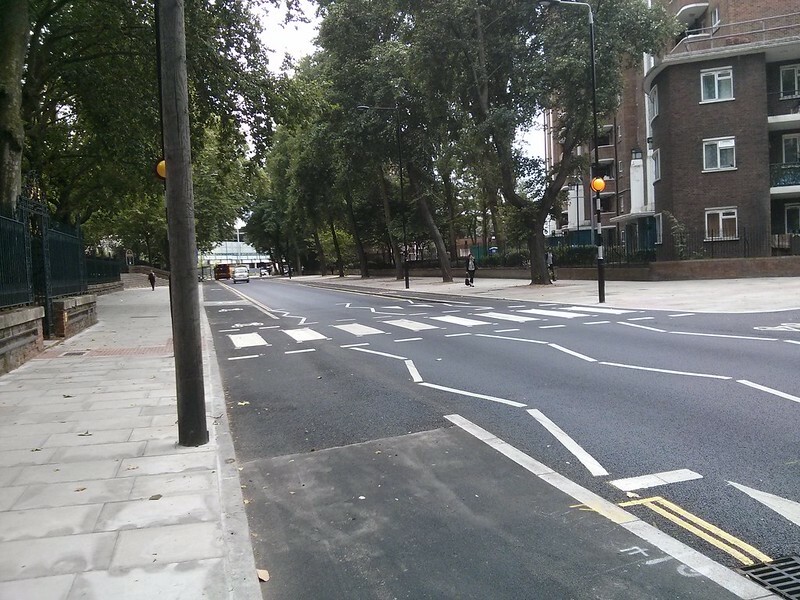 It was also observed that the zebra crossing near Chenies Place is now operational. Also that a yellow bollard has been installed by the entry to the track to warn drivers to stay on the road. 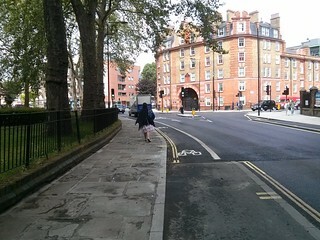 a stepped track on the east side of Pancras Road between Royal College Street and St Pancras Way. See the photo on the left. 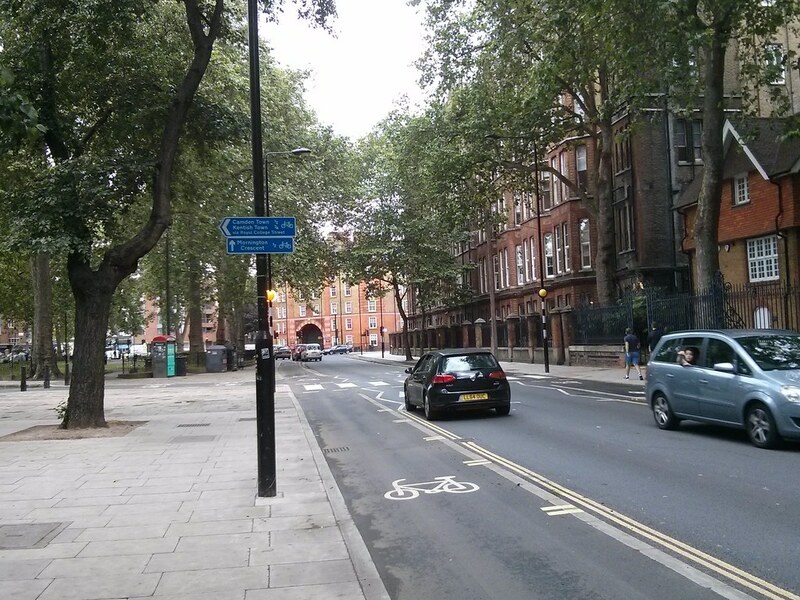 a more suitable approach on St Pancras Way to the junction with Pancras Road. 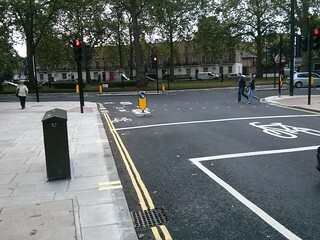 Previously the left- and right-turning lanes were separated by a wide island. In the new arrangement, left-turning cycles are protected by an island and then access the existing southbound stepped track. 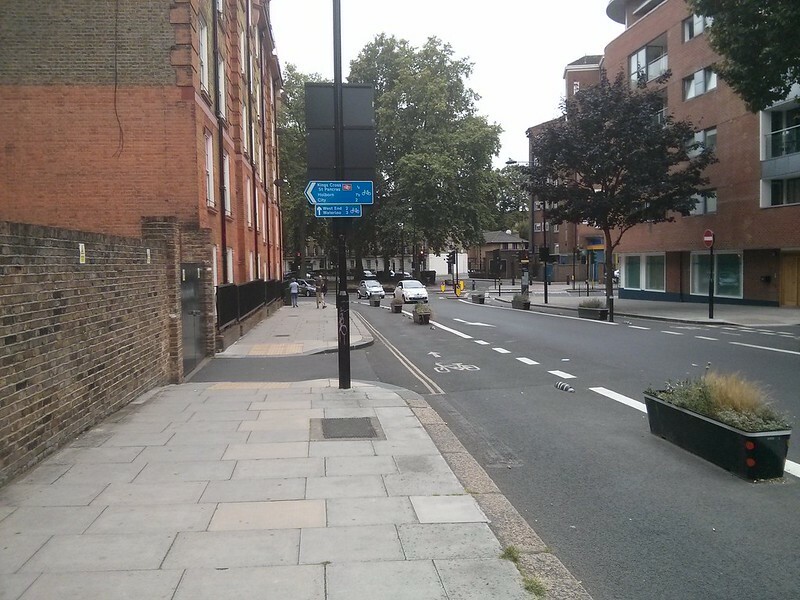 If they want to join the Somerstown route, they can turn right at the raised junction with Goldington Crescent. 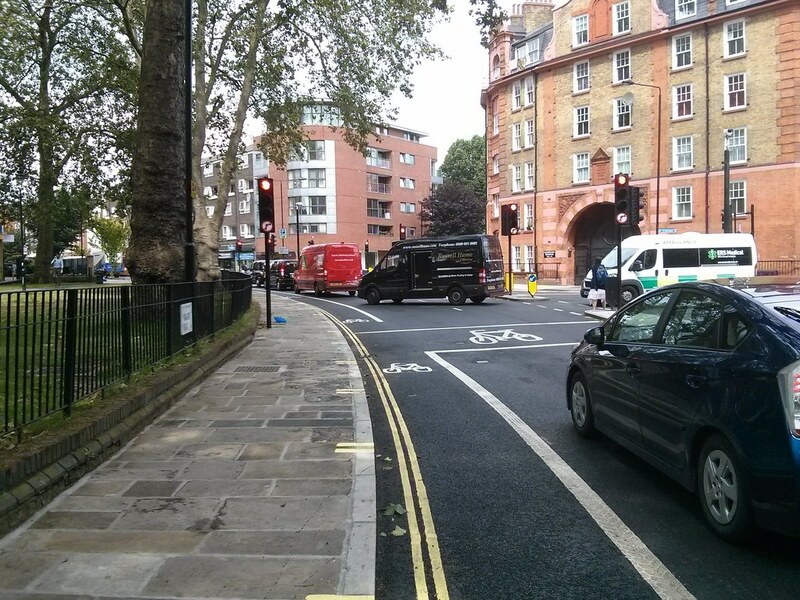 Northbound cyclists will normally turn left into Goldington Crescent to avoid the extra set of signals. 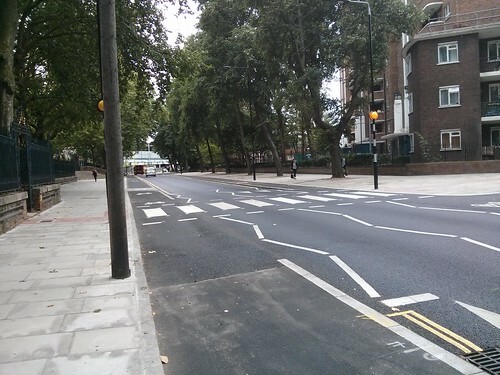 Anyone heading to Mornington Crescent will continue on Pancras Road via the junctions with St Pancras way and Crowndale Road. 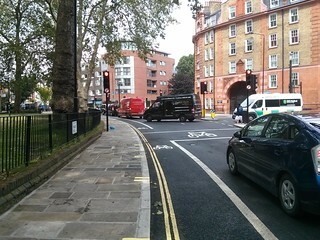 Motor vehicles turn right into Royal College Street at the second junction and some cyclists make this manoeuvre but it is not recommended when the route via Goldington Crescent is simple to use.